Spaghetti Squash is quite possibly one of Mother Nature’s greatest inventions. With a texture similar to spaghetti, calories much lower and health benefits much higher than pastas, this vegetable makes the best meal! 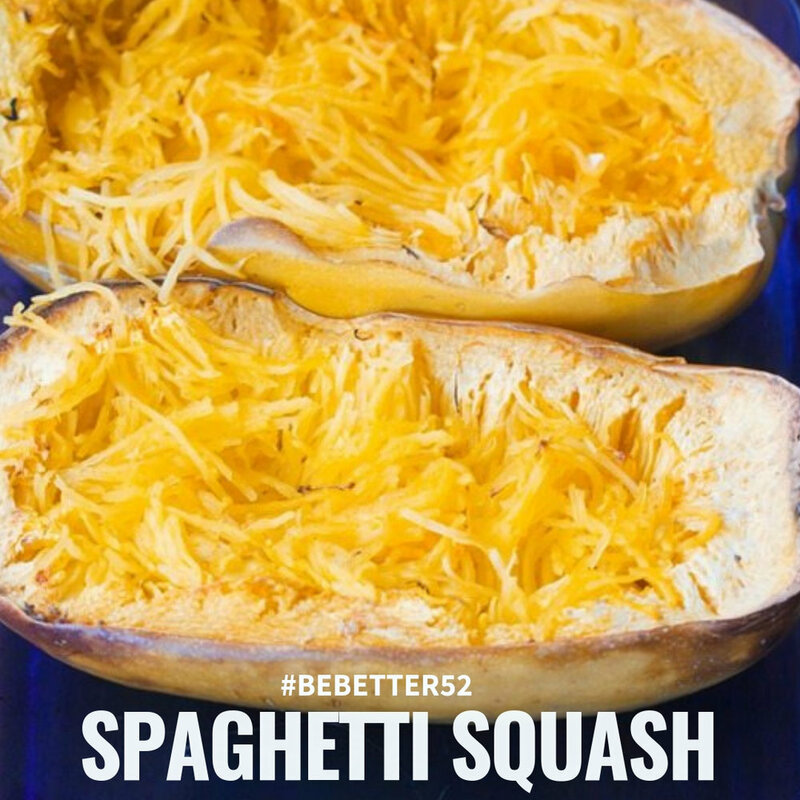 Here at The Be Better Movement, we are obsessed with Spaghetti Squash and all of the fun recipes we can make with it! For this week’s challenge, we’d simply like you to make and eat spaghetti squash for one meal this week. We’ve even added some fun recipe recommendations that might appeal to you and your family. Why did we choose Spaghetti Squash? Well, Spaghetti Squash has health benefits that greatly outweigh that of any pasta, so this substitute is perfect for eating healthier! Also for people who want to eat gluten-free, this food is wonderful (not to mention so yummy). For instance, spaghetti squash is a low-carb, low-calorie vegetable, which when cooked properly, creates strands similar to that of spaghetti. It belongs to the Cucurbitaceae family of vegetables and fruits, which also includes Pumpkin, Cucumber, Acorn Squash, Zucchini and Melons. Nutrition and You states that in 100 grams of spaghetti squash, there are only 31 calories. There are no saturated fats or cholesterol in this food, and it’s rich in fiber. Also, spaghetti squash actually contains Calcium, Iron, Vitamin A and Vitamin C, to name a few of the many vitamins and minerals inside this powerful food. While tons of delicious recipes can be found with Spaghetti Squash, the first step is always to cook the actual squash to achieve those spaghetti-like strands. This part seems a little daunting, but is actually easy! There are various ways people like to cook Spaghetti found on the internet, such as fully microwaving or fully baking, but we’ve written down a bit of a hybrid that is our favorite. Poke holes with a fork all throughout the Spaghetti Squash. Set in microwave for 4 minutes to help soften the spaghetti squash so it is easier to cut in half. After the microwave, cut the Spaghetti Squash in half lengthwise so that each side looks like an oval. If too hot, use a heat pad over the squash when handling it. Time to scoop out the guts! Similar to gutting a pumpkin, grab a spoon and remove the seeds and loose strands until all the seeds are gone. Put the two halves on an aluminum foil covered baking sheet. Drizzle olive oil on top. I prefer to brush it all around so that the olive oil covers the entire inside of the squash. Add salt and pepper to taste. Flip the squashes upside so the skin of the spaghetti squash is upright, and the cut side is upside down. Put into heated oven and cook for 1 hour. Pull out squash, and grab your trusty fork to scrape out the “spaghetti” noodles! Voila! You have delicious spaghetti noodles that are low-calorie, low-carb, and vitamin packed! Now is the time for fun ways to dress it up! Heat minced garlic and olive oil in pan until golden (3 minutes). Add in desired amount of spaghetti squash noodles and toss while heating (5 minutes). Add freshly grated parmesan into pasta and enjoy! This pasta is so easy. Simply add your favorite Marinara or Bolognese sauce (homemade or store bought) onto your heated up pasta! You could serve with meatballs for the perfect twist of these Italian favorites. Heat tablespoon of olive oil in pan. Put in desired amount of spaghetti squash and pesto sauce. Heat for 3-4 minutes. Add in grilled chicken, parmesan, and sprinkle with pine nuts for this delicious dish! Overall, this challenge has so much variety! With nearly endless possibilities for spaghetti squash dishes, you can’t go wrong! Maybe switch up a family pasta recipe by adding spaghetti squash, or create a new favorite. Whichever direction you decide to go, you’re sure to have fun doing it and have a delicious meal afterwards!